Prepare to return to the world of Magnamund, this time with your friends. The Lone Wolf Multiplayer Game Book is a full roleplaying game, based on the simple rules system of the solo books - it is so easy, anyone can play! 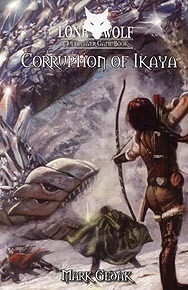 A brand new mini-campaign for the Lone Wolf Multiplayer Game Book, Corruption of Ikaya sees the players travelling to the Ice Wastes of Kalte to discover the fate of Kai acolyte Greyshadow and delegates of a Sommlending merchant house. Along the way, they will face Giaks, cross the Kaltesee, face saboteurs, visit the Ice Fortress of Ikaya, battle Frostwyrms and Ice Demons, all to face a terrible evil that may ensnare them in its own plans. Suitable for all character classes.